In probably the most food-consciously satisfying news to come along since it was discovered that Bacos are 100 percent vegan, PETA2 (PETA’s tubular teen branch) announced last week it has named Chipotle as the Best Fast Food Chain. Chipotle won the Libby Award (short for “liberation”) for its dedication to sustainable farm practices, commitment to serving only humanely raised meats, and extremely veg- and vegan-friendly menu. This is fantastic news because: A) Chipotle is unfailingly delicious and satisfying, so much so that I (and others) have been known to order two burritos at once with the intention of saving one for dinner, only to take both to the head in under an hour; and B) Our love of it is doubly justified when you can actually feel decent about the company and products you are supporting, with their damn ethics and everything. The PETA2 press release dropped some news about a new roasted vegetable, all-vegan burrito the company is testing out. 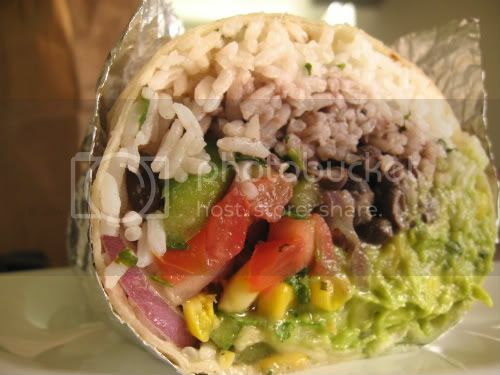 The restaurant also recently introduced a vegan “Garden Blend” burrito, which features vegan chicken, grains, and marinated vegetables and is available at select locations in New York City and Washington, D.C. Currently, we are just testing Garden Blend at our DuPont Circle location in Washington D.C. and our Chelsea West location in New York. Those are the only two locations we are testing this in right now, but we hope all goes well so we may offer it in all of our restaurants. Say it with me now: NEW CHIPOTLE BURRITO. Remember in The Wizard where they unveil A NEW GAME!! and it’s Super Mario 3? Excitement is parallel. Which means I will be heading to Chelsea ASAPaliciously. population cycled through the College Park Chipotle every week. It was, for a good while, the No. 1 grossing Chipotle in the world, finally dethroned only when they opened 75 other locations in a few mile radius to sate the demand. As epically busy as the line was (usually reaching the door at all times), the restaurant was a Fordian model of high-octane efficiency on behalf of both staff and customers, only occasionally disturbed by the unseasoned newb staring too long at the menu or reaching their grubby hand over the glass shield to point at the beans, for which they were made into a public object of derision and scorn and nearly booed out of the restaurant by the armistice alliance of hungry sorority girls, college journalists and basketball players waiting behind them. And in the same round of Libby Awards, PETA2 named VegTerps, UMD’s animal rights and veg organization, as the Best Student Group. Coincidence? Probably. But It’s a good opportunity to say GO TERPS anyway. This entry was posted in Uncategorized and tagged burritos, chipotle, college park, PETA, terps, the diamondback, university of maryland, vegetarians. Bookmark the permalink. Etan Horowitz wrote the first ever article about Chipotle for the Diamondback. His dubious ethics lead him to accept coupons for free burritos and my dubious ethics lead me to steal them from his desk. COLLEGE! I continue to eat at Chipotle about once a week. I patronize the chain’s Decatur, Ga., location. Chicken burrito with pinto beans. Every time. And I read my book. It’s the finest hour of my work week. some of my favorite moments in College Park involve eating a warm burrito over a fresh, cold Washington Post from WaWa. Now WaWa closed as did the College Park Post plant. But Chipotle lives on and on. When I covered the Bowie Chipotle opening, the manager tried to thrust a stack of burrito coupons into my hand several times. It was the strongest test to my ethics ever but I turned them down repeatedly. My photographer, however, scooped them up like Mario coins. Barry, The Ethics Board rules that your actions were justified. See, Donnelly, the key is to refuse the coupons to preserve the appearance of ethics and then steal them away from him when he’s not looking. Then, you have obligation to write a positive story because he doesn’t know you took them and you get the free burritos. Crime pays. There’s someone from Rubenstein Associates, Inc. who has looked at this post at least once a day every day since it went up. Who are you? Why are you so fascinated by this? Did you try the newritto yet? ?